The NCR, National Capital Region boasts of an Institute of National Importance that is also a Deemed University, The SPA, with Departments of Urban Design, Transport Planning, Industrial Design, Architecture and a lot more, the NCR also has 4 other schools of Architecture and Planning, to add to this fray the Delhi State has School of Social Design at Ambedkar University Delhi, and still we get to see this. 74 foot over-bridges and a skywalk is an appalling waste of public funds to arrive at this conclusion. What is the point of all these institutes if the PWD and the MCD have bureaucrats and engineers with little vision, and even less common sense making decisions. It would cost the government nothing, to put exercises for improving the public realm to these institutions and ask for their well considered opinion and design solutions. Opportunities to make positive change are lost over and over again in this shortsighted vision of development that seems to ail every aspect of our development work. You see it on the Pavement. You see it on the Delhi Metro Stations, on the walls and floors of your housing complex, in the classrooms of the schools you attend or teach in. You see it on the road, in the public toilets, in the local markets. There is a good chance you see it at home too. The faulty drawer in the kitchen that wont shut, or the bent window frame that lets in a small cust of cold winter air every-now-and-again. Or the flaking and slowly disappearing plaster and paint of the new IIT hostels on the ring road! More correctly, we see the absence of it. One would imagine, that buildings, and public facilities are designed to be permanent, and lifelong. Of course that is a fallacy. Materials have life cycles, and like everything else, mam-made or otherwise, experience wear and tear, from use and weather, they undergo stresses and strains, sometimes even damage. To design a building, without expecting as much is foolhardy, and to commission projects and not expect to have to maintain them- or to put it more directly - to expect not to have incur expences on account of periodic maintenance is a rather self defeating idea as well as guarantee for raking up large expenses on account of repair, and replacement that might far outweigh the costs of periodic upkeep, not to mention the ease and comfort of having a working, long term system in place and functional at all times. One might argue that the private individual, who sometimes very unwisely sink all their available resources and more into affording housing/ or cars or whatever else they fancy, might be strapped for funds when maintenance is concerned. But I fail to see how public projects, and infrastructure could be effected by this? Or is maintenance just some thing we never plan for! If that is the case it is a huge issue? Do planners and designers actually think about this? Wear and Tear, that maintenance is a real concern and a means to achieve both frugality and economy, and a great degree of environmental and material responsibility. Is it policy failure? or is it apathy? or are funds being siphoned off? One does wonder? Its almost everywhere and No one seems to mind! The idea that the means for getting people, or should we say workforces, from places of their unusefulness ( read, rest, family life, personal engagement and development) to places of employment has been for over half a century the primary preoccupation of city planning and infrastructure design. In our own backyard we see the first signs of it in Chandigarh – lines drawn across a dusty plane as fastest and straightest connection between two points for transport of people using autonomous motor-vehicles – what we call cars today! For ease of navigation and efficiency, the lines are straight, and a right-angle grid spreads across a predetermined area, establishing its primary structure. Everything else, though beautifully extolled and celebrated in post event rationalisations, could as easily be argued as simply an unavoidable aftermath. The motorized private transport has been the engine of modern urbanism, providing access, and freedom, and of course aspiration. The image of the big, modern city was never without cars, flyovers, and even personal flying transport. But in a century of this kind of transport being around it has not really made the city any better. And mass, rapid transport, has only added to that woe. The issue, one begins to see, is not in the nature of the vehicle, but in the myopia and shortsightedness of the visions that have been driving their inclusion in urbanism. And of course the fact that the city, once again has turned into an engine of economy and not a place of Culture, Art and Life as it was hoped and theorised. You only have to drive/ walk around Delhi and Gurgaon, and the manner in which Transport oriented infrastructure has mauled and fractured the urban experience cannot be hidden by any amount of beautification or insertion of novelty. The absence of Pedestrian facilities at the massive flyovers at AIIMS intersection, or the completely callous placing of Metro Pillars, squarely on pavements ( that are meant to be used by the very same people, the metro is provided for), or the huge messes of over-and underpasses for motor-vehicles that are designed without a thought that citizens walk too. That the experience of walking should not have to be one of traversing an obstacle course laced with death-traps, seems to be the least of the concerns of the designers and policy makers that pen these decision from their Out-look Towers, and air-conditioned chauffeured sedans. 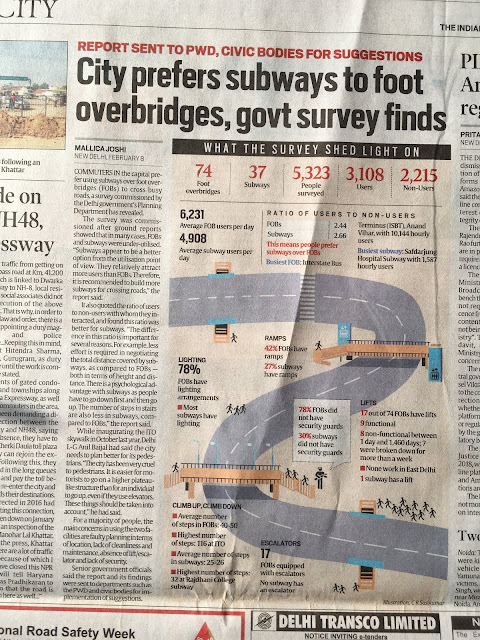 At this point is might be also pertinent to remind ourselves of that ridiculous idea of Transport Oriented Development, TOD for short, that has been, ( or was) touted as the future of Delhi by the very capable DDA. That discussion we shall save for another day. Much of the notion of the city relies on the car as aspiration, and that you haven’t arrived, or made it until, you can afford one. I remember tweeting, once – The affordable (cheap) motorcar has been used to sell us (really) bad urbanism. I wonder if you would agree? Every other day the city sprouts another marvel( or monster) of public work, destroying whatever is left of the Urban Public space, and it doesn’t help that there is this perception that the public space of the city is unsafe. It was not always unsafe, that’s what the urban-designers, city-planners and policy makers have made it. Bit-by-bit, cutting it up, destroying any kind of legibility, de-humanising its scale, and completely neglecting the needs of citizens that live outside of gated safe-houses and controlled private enclaves. It makes more sense to do this for two primary reasons – you can control people better, and the way more important one – privately help public space requires you to spend money, both to access it and once within to receive service. Neither of these were possible in the democratic space of the city. Present day urbanism thrives on the aspiration of Privately held Space (that is carefully kept in short supply), controlled and limited access – a visit to Gurgaon especially along the high value Golf-course road would make this quite apparent. You can see the same in varying degrees all across the NCR. The Notion that better transport infrastructure will make a better city, or give you a better Quality of life, of even raise your standard of living, seems to be falling apart quite rapidly! But you would see that if you walked on the streets, and if you had your feet on the ground! And if you were not looking at the world from the back seat of your luxury car with rose tinted glasses! Post Script - The city as I see it now is a little zoo designed to keep you working, so you can make the money to buy the things that you never needed, that large corporations want to sell you after which, so you can get drunk on overpriced alcohol in safe havens on a weekend before you can go back to work on Monday! Its so much easier than making a city where you could go for walks, talk on the streets and meet people, and generally enjoy a beautiful urban experience. But then that wouldn’t make anyone any money!